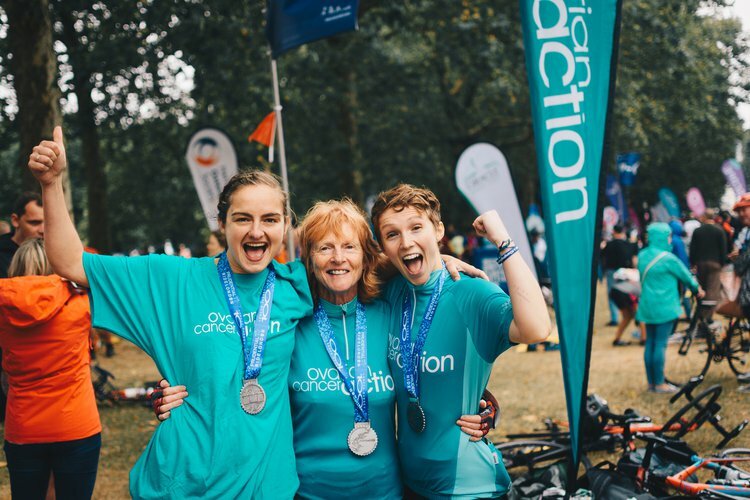 On the 12th May 2019 take part in Ovarian Cancer Action’s brand new challenge event; a 100km cycle from London to Oxford! Winding through Oxford’s beautiful historic centre and ending up at the John Radcliffe Hospital, where Professor Ahmed's vital research is taking place, this scenic and mostly-flat route is a fantastic challenge for cyclists of all levels. The cycle will help fund research at Oxford University into the development of the world’s first ovarian cancer screening tool. This could be the first of its kind and one of the most exciting developments in ovarian cancer research in recent years. If ovarian cancer is detected at the earliest possible stage, a woman could have a 90% chance of survival. If is detected in late stage, her chance of survival reduces dramatically to as little as 4%. And yet there still no reliable method to detect the disease early. By joining Ovarian Cancer Action on this cycle you can help fund research to find the world's first screening tool for ovarian cancer. A screening tool could detect ovarian cancer at a much earlier stage than current methods. Find out more about the research. Use your pedal power as a force for good and join Team OCA for this new challenge and be part of something truly unique. Starting at Richmond Park, we will cycle up past Hampton Court Palace and head along the Thames. We will then head through Old Windsor towards Dorney and up through Marlow, over to Christmas Common, passing the windmill from Chitty Chitty Bang Bang en route! We then cycle through Oxford and finish at the John Radcliffe Hospital, where Professor Ahmed’s vital research is taking place. This scenic and mostly-flat 100km route is a fantastic challenge for cyclists of all levels. What kind of bikes are allowed? Road, mountain or hybrid categories are recommended. If you’re planning to ride a bike, such as a tandem, that doesn’t fit within this category then please get in touch to let us know. Tri-bikes/Tri-bars are not recommended for the safety of group cycling. We would also advise against electric bikes in case the battery dies. What cycling safety equipment do I need? All riders are required to bring a helmet and bike lights. Gloves and glasses are also recommended. We also ask that spare inner tubes are carried, along with a pump for peace of mind. What time will we be setting off? We will be leaving at 9am on the 12th May 2019 from Richmond Park. We have chosen Richmond Park due to the proximity of hotels and affordable day/night parking should you choose to stay over in Oxford. What time will we get to Oxford? We will arrive in Oxford late afternoon, around 5pm. Will there be catering on the ride? Yes, the stops in the morning and afternoon with have water and light snacks. We will also have a longer stop for lunch where food is provided. Will my luggage be transported to Oxford? Yes, please pack economically in a soft hold-all type bag, this will be transported to the finish point at Oxford. Yes, repairs are free, parts are charged as required. Yes, a doctor will be cycling towards the rear of the group and medics will be on call throughout.